Are you looking for excellent home cleaning service providers to clean bathrooms, kitchens, hallways, living rooms, dining rooms and more? Well, look no further. Sears Maid Services is a locally operated team of professional cleaners with years of experience in residential and commercial cleaning. If you're interested in regular cleaning services or a one-time deep clean, count on Sears house cleaning experts. Nothing is overlooked, and everything from ovens to toilets is cleaned, as well as other hard-to-clean areas. Give us a call at (305) 515-2636. Sears Maid Services understands how valuable your time is, which is why we offer regular cleaning services to fit your schedule. We offer convenient weekly, biweekly and monthly scheduling. Give us a call to schedule your home and apartment cleaning. Perhaps you are holding a yearly event or want to get that spring cleaning over with. Sears Maid Services are here to help. We offer a Deep Cleaning service that goes above and beyond our regular cleaning. We are just as thorough but pay extra attention to additional cleaning requirements. You worked hard to establish your business, why not improve the look and feel of your office space by having Sears Maid Services professionally clean and tidy up the workspace. A clean area displays the pride you, your staff and employees have for the company. Sears Maid Services will keep your office clean and maintained, so you have more time to dedicate to your business and not have to worry about the cleanliness of the building you work in. Construction of a new home can be a very untidy process. From drywall fragments to wood shavings, most rooms within the home will need a professional cleaning. Turn the new home into someone's dream home with the help of Sears Maid Services. Most construction companies require cleaning services before potential buyers, realtors or inspectors enter the house. Our professional cleaning staff will mop and vacuum all flooring to remove dust, debris, and silicon from the site. 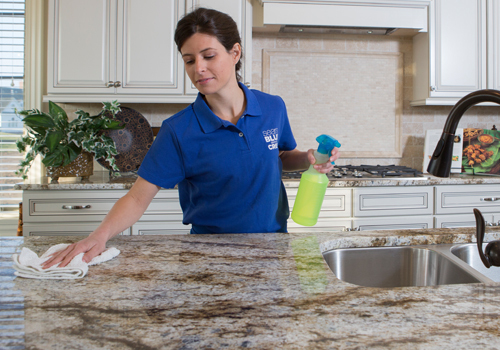 We will even wash and sanitize all surfaces. Sears Maid Services knows how difficult it may be to allow others into your home or office, and that's why we vet each potential employee. We screen prospective employees with background checks during the hiring process. Once hired, all employees undergo extensive on-site and off-site training to ensure knowledge and skills required to deliver excellent results are acquired. Sears Maid Services understands that succeeding in the home cleaning industry does not just mean professional and exceptional work but also having a strong, trusting relationship with our clients. We are extremely confident in the quality of our services that we guarantee our results. If you are not satisfied with the cleaning results, just call us and describe the deficiency within 24 hours of your last cleaning. We will send an associate to the location and inspect the work that was performed. If we seem to have missed something, we will return and correct the mistake at no extra charge to you.